SUP thrills on land with Sk8pole Land Paddles, GO! 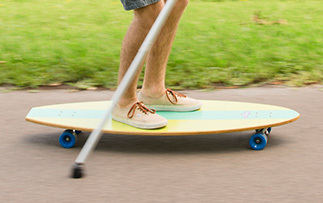 Simply add the Sk8pole land paddle to your current board for a SUP experience on land! The Sk8pole land paddle is lightweight and stable, built with a unique pusher tip designed to mimic the efficiency of a race horse’s foot. The patented rubber pusher tip of the Sk8pole grips the ground so it is very simple to use with minimal learning curve for new land paddlers. 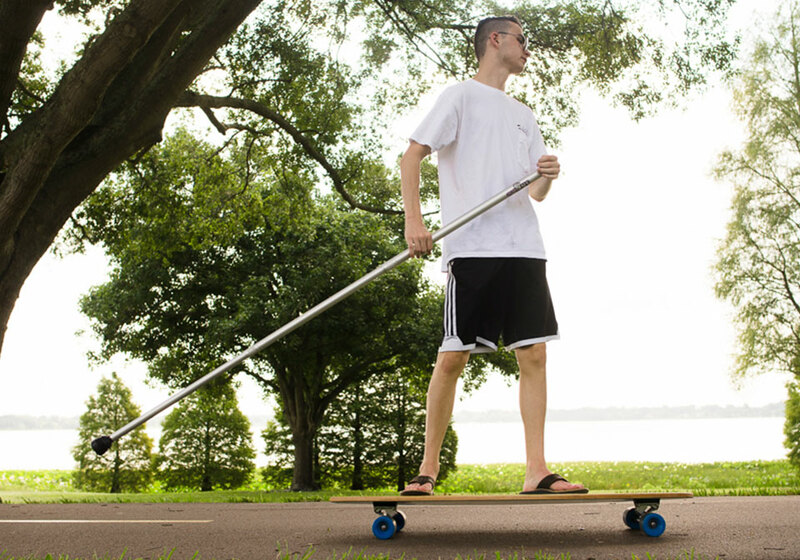 The Sk8pole is easily adjustable (collapses) so it is kid-friendly and easy to transport. The Sk8pole land paddle was developed over several years of improving and testing to bring the best land paddling experience to ALL ages and ALL sizes. The fact that the aluminum Sk8pole is telescopic and light weight is a real help when it comes to traveling a stupidly long way – it’s easy to just fold it up, attach it to your pack and forget about it when you don’t need it. I am very impressed with how well mine is lasting; I was using it during training before my trip across The Netherlands and I’m still using it now with no maintenance or replacement parts needed. I’m very glad I had my Sk8pole on my trip and I think there is a place for one in any skater’s quiver. The Sk8pole Land Paddle is such a great product! I ordered one from Amazon a few weeks ago and so far it has performed well above my expectations. I’m probably a bit bigger and older than the average skater. I’m over 6 feet tall, weighing in at 240 pounds, and 45 years old. Over the last ten years, multiple forms of arthritis have severely diminished my ability to skate and surf like I used to. Thanks to Sk8pole I’ve been able to start cruising around again; it’s hard to describe how great that feels! My friend, another big stick owner, recently replaced the road blade on his aluminum big stick and we swapped my aluminum Sk8pole with his big stick during a 4.5 mile run. The big stick road blade slipped on most strokes and the Sk8pole performed much better with little or no loss of grip. 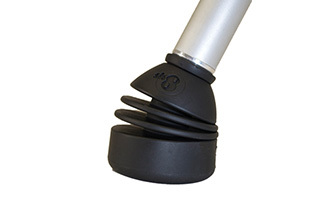 Sk8pole Land Paddle’s multi-directional rubber pusher tip maintains 100% ground contact. Three section aluminum pole reduces to 33 inches and extends to 6’ 4” for easy transportation and use by all ages. The Sk8pole Land Paddle is light-weight (1.8 lbs) and evenly distributes weight while paddling.